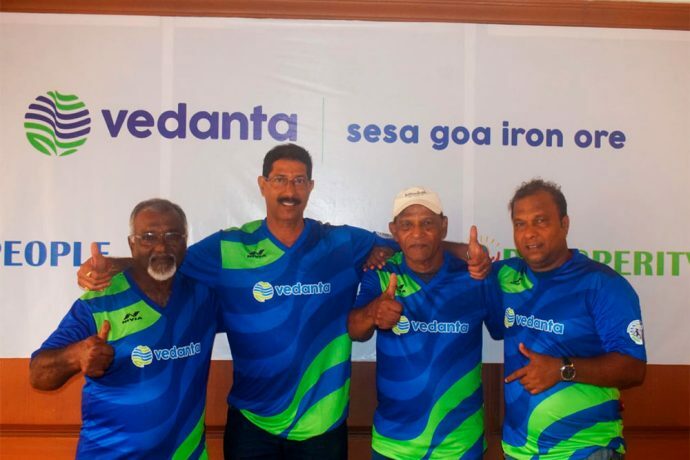 Vedanta Sesa Goa Iron Ore is the key sponsor of the ongoing AWES Cup 2018. The company’s commitment to football development reflects in the prestigious Sesa Football Academy, the Vedanta Women’s League and the Vedanta Football Schools grassroots programme. As a part of its commitment to the ex-players and the legends of the game, Vedanta in collaboration with Association for the Wellbeing of Elder Sportspersons (AWES) is organizing the highly anticipated ‘Legends Match’ before the final match of the AWES Cup 2018 on September 15. The scheduled kick-off is at 4 P.M. at Tilak Maidan, Vasco. 50 ex-players would take the field along with celebrities of Goa. Notable names featuring in the match are Brahmanand Sankhwalkar, Bruno Coutinho, Francis D’Souza, Savio Medeira and Armando Colaco. One would see renowned personalities and celebrities joining the match including Avertano Furtado (President, AWES and Ex-Fisheries Minister), Glenn Ticlo (Ex-Sesa Goa FC and MLA of Aldona) and Benjamin Silva (Ex-MLA). Ex-India star IM Vijayan and former Vice-Captain of India, Renedy Singh would be showing their support to the cause and playing on either side. The players are being divided into two teams with many who had donned the color of Sesa Goa FC in their glorious days. Out of these participants, 17 had played for the country and 5 have been the National Captains. This by far is the biggest gathering of football legends to have come together for a match not only in Goa but also in the country.